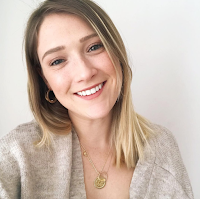 It's not often I do a skincare post as I'm someone who usually sticks to the same products year after year as I'm worried that trying new products ultimately results in unwanted break outs and allergic reactions. However, I've been making it my mission to not only use up new products, but also branch out a bit more when it comes to skincare and recently it seems that I have found a great bunch of products that really work together. My dry skin has been increasingly more moisturized and very clear which I could not be more grateful for now that the Summer heat has been hitting us and I've been needing to lessen the foundation coverage. 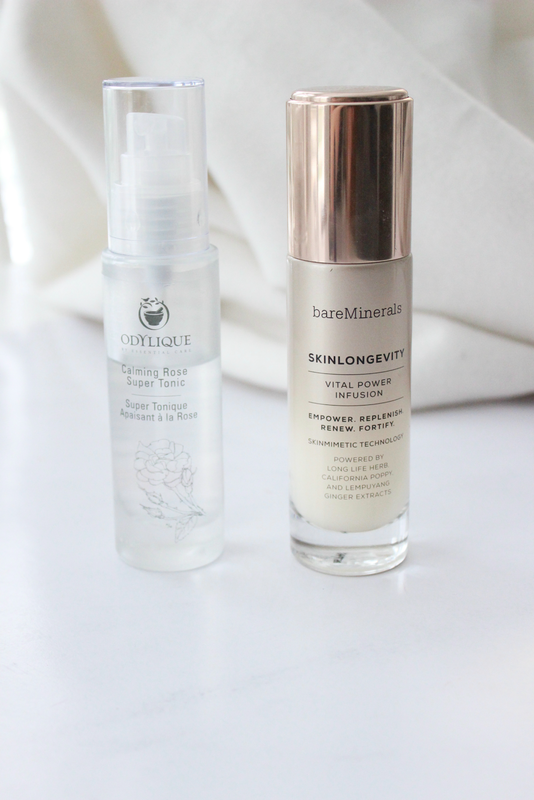 A product that I wasn't too impressed to begin with is the BareMinerals Skinlongevity Vital Power Serum. When I first gave this a try I just didn't see anything different happening to my skin and for a £45 priced product, I felt a little gutted. However now that I'm actively using it in my everyday skincare routine, I have been noticing a difference in my skin softness and overall brightness. I love applying this prior to my foundation as I think it helps smooth my skin out and just gives it that extra bit of moisturizing needed in the morning. The Odylique Calming Rose Super Tonic is perfect to remove any access product just after I've cleansed. Previously I've had some bad experiences with Rose products causing me allergic reactions, however thankfully I haven't with this one. I think this along with the BareMinerals serum has really helped the overall hydration of my skin. I've also noticed that the blotchiness around my face has massively reduced which is definitely down to the Calendula flower extract which helps ease inflammation. A product I've finally gone back to using is my beloved Lush Ultrabland Cleanser. Oh how I've missed this product. I've raved about this product countless times on my blog. This cleanser is so perfect for anyone with dry skin as it is enriched with almond oil which is packed with Vitamin E and great for hydration. I usually find after cleansing my face with more alcohol-based products that my skin feels parched, whereas with Ultrabland it just feels fresh and soft. My moisturiser of choice has been back to the First Aid Ultra Repair Cream which although is a heavy-duty moisturiser, it completely soaks into my skin and is an exceptional hydrating product for those with sensitive and severely dry skin. I really notice a difference when I use other moisturisers instead of this one and therefore I won't be parting with it anytime soon. 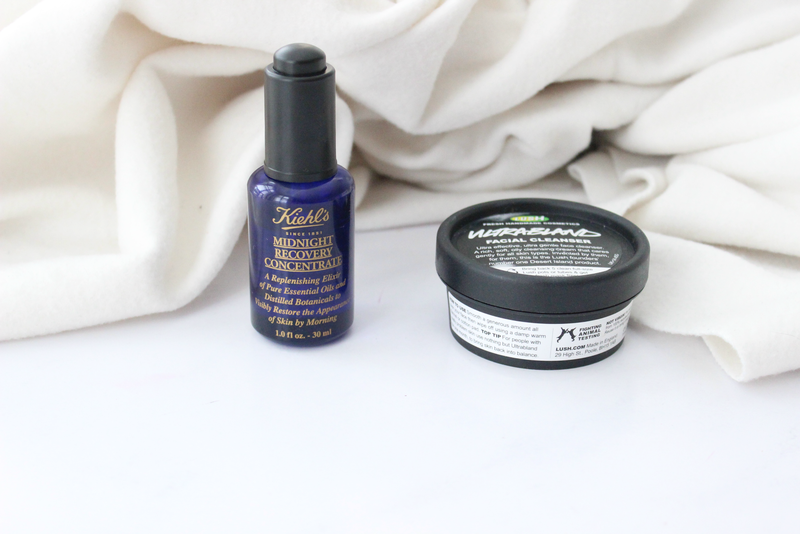 Lastly is my all-time holy grail skincare product, the Kiehl's Midnight Recovery Oil. I picked this up a while ago and use it every evening and I think this is what has completely stopped the hormonal and other spots from occuring on my face. When I stopped using this for around 4 months after running out of my first bottle, I started experiencing a lot more spots and also the lines on my forehead which had started to fade, showed up again. This has just been a total life saver and I highly reccomend asking Kiehls to sample this if you can! I love the sound of the Bare Minerals one! I haven't tried any of these, however, I've found that if you stick to a beauty regime for long enough, one usually starts to see results. Glad you found some incredible products that really work for you! I'm such a fan of LUSH cleansers! Angels on Bare Skin is so soothing and really works to calm any flare ups! I haven't used Ultrabland before but I might just have to! I think I am going to have to try the Bare Minerals one, I am trying so much to be more strict with my skincare! I have been curious about that kiehl's midnight recovery oil for a long time now. I think I need to bite the bullet and repurchase it. I didn't know bare minerals did skincare. I am yet to try anything from the brand I definitely want to try out their primers and now I definitely need to take a peek at their skincare stuff.